Huawei's shiny new smartwatch is almost ready to go after the company revealed it's “right around the corner”. The Chinese firm's entry into the Android smartwatch space was first announced back at MWC 2015 and from the shots we've been teased by so far it looks like one of the most stylish options out there. Huawei's Android Wear device will have be made of stainless steel and sport a 1.4-inch sapphire crystal AMOLED display, Qualcomm Snapdragon 400 chip, 512MB of RAM, 300mAh battery and is available in black, gold or silver. The Huawei Watch website goes on to explain that it is designed to track health and activities using its onboard sensors, has ergonomic button placement to improve its ease of use and Android Wear gives it all the features you've come to expect from a Google-run smartwatch. Beyond saying that it's “right around the corner” there's little else regarding the device's release date and with IFA 2015 not that far off it's not farfetched to think that Huawei's first smartwatch will see the light of day at the event. The UK is among 20 countries that will get the new device on launch day and the others are the USA, Argentina, Australia, Brazil, Canada, Denmark, Finland, France, Germany, Hong Kong, Italy, Japan, Norway, Philippines, Russia, Singapore, South Korea, Spain, Sweden, Switzerland, United Arab Emirates. Huawei Watch review: wonderfully premium, but is it the best? 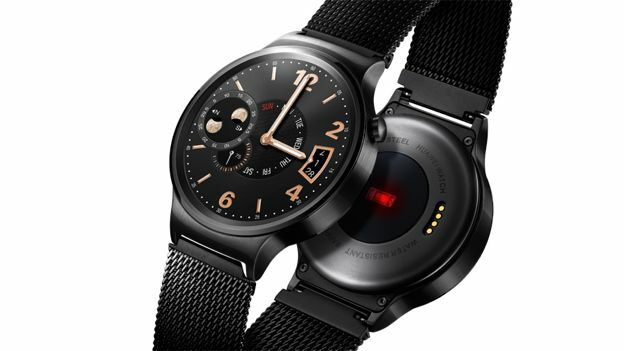 Is Huawei's elegant and powerful Android Wear smartwatch a Moto 360 beater?